Competition between two or more companies where all companies produce similar (but not exactly the same) products, but all leave some excess production capacity so that total supply for the market does not meet demand. This results in product prices remaining artificially high and therefore larger profits for the companies involved. Monopolistic competition, when it is the result of collusion between companies, can be illegal under some circumstances. It contrasts with perfect competition. Fig. 130 Monopolistic competition. See entry. (a) Short-run equilibrium. (b) Long-run equilibrium. many firms and buyers: that is, the market comprises a large number of independently acting firms and buyers. differentiated products : that is, the products offered by competing firms are differentiated from each other in one or more respects. These differences may be of a physical nature, involving functional features, or may be purely ‘imaginary’ in the sense that artificial differences are created through ADVERTISING and SALES PROMOTION (see PRODUCT DIFFERENTIATION). free market entry and exit: that is, there are no BARRIERS TO ENTRY preventing new firms entering the market or obstacles in the way of existing firms leaving the market. (No allowance is made in the ‘theory’ of monopolistic competition for the fact that product differentiation, by establishing strong BRAND LOYALTIES to established firms’ products, may act as a barrier to entry). Apart from the product-differentiation aspects, monopolistic competition is very similar structurally to PERFECT COMPETITION. The analysis of individual firm equilibrium in monopolistic competition can be presented in terms of a ‘representative’ firm, that is, all firms are assumed to face identical cost and demand conditions and each is a profit maximizer (see PROFIT MAXIMIZATION), from which it is then possible to derive a market-equilibrium position. the firm's cost structures (MARGINAL COST and AVERAGE COSTS) are raised as a result of incurring differentiation expenditures (SELLING COSTS). The firm, being a profit maximizer, will aim to produce at that price (OPe )-output (OQe) combination, shown in Fig. 130 (a), which equates marginal cost (MC) and MARGINAL REVENUE (MR). In the short run, this may result in firms securing ABOVE-NORMAL PROFITS. In the long run, above-normal profits will induce new firms to enter the market, and this will have the effect of depressing the demand curve faced by established firms (i.e. push the demand curve leftwards, thereby reducing the volume of sales associated with each price level). The process of new entry will continue until the excess profits have been competed away. Fig. 130 shows the long-run equilibrium position of the ‘representative’ firm. The firm continues to maximize its profits at a price (OPe )-output (OQe) combination where marginal cost equals marginal revenue but now secures only a NORMAL PROFIT return. This normal profit position for the firm in the long run is similar to the long-run equilibrium position for the firm in perfect competition. But monopolistic competition results in a less efficient MARKET PERFORMANCE when compared to perfect competition. Specifically monopolistically competitive firms produce lower rates of output and sell these outputs at higher prices than perfectly competitive firms. 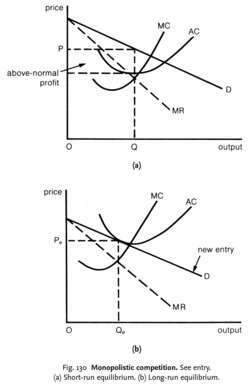 Since the demand curve is downwards sloping, it is necessarily tangent to the long-run average cost curve (which is higher than the perfectly competitive firms’ cost curve because of the addition of selling costs) to the left of the latter's minimum point. Firms thus operate a less than optimum scale of plant, and as a result there is EXCESS CAPACITY in the market. Indeed, if quotas can be meaningful when one considers a set of substitutable goods, they are not anymore when the demand is expressed on goods in monopolistic competition. What Efficiency and What Future for the Cultural Quotas in the Digital Age? Some aspects of international trade under monopolistic competition, in Explorations in Economics: Notes and Essays Contributed in Honor of EW. As discussed in Hornstein (1993) as well, the key to understanding the effects of monopolistic competition (leaving aside product space variations through entry and exit) concerns the introduction of overhead costs, which are needed to absorb the profit from markups. Other important features of the monopolistic competition model being examined in current research are product quality and product variety. Matsuyama (1995) provides a survey of models of cumulative processes based on monopolistic competition. 149) as 'classical Marshallian', and exerted a tremendous influence on later generations of economists, particularly Chamberlin's recognition of the importance of oligopoly as a major form of 'small group' monopolistic competition in the real world. This line of research of the New Economic Geography is based on a series of prior contributions such as: the monopolistic competition model of Dixit-Stiglitz (1977), which opened new perspectives in economic research; the "iceberg" model of transport costs of Samuelson (1952); the research on imperfect market structures and on the origins of international trade (Helpman & Krugman, 1985). Their results reveal that banking markets of the industrialized countries are characterized by monopolistic competition and sometimes even perfect competition cannot be excluded. In this regard, Krugman (1991), Fujita (1993) and Venables(1996) are regarded as having given birth to the NEG paradigm, which uses full-fledged general equilibrium models with monopolistic competition a la Dixit and Stiglitz (1977). The current mobile ecosystem is best understood in terms of the monopolistic competition model of interaction amongst consumers and producers (1).